I said I would post Budapest on Monday. But it's Tuesday. Once again we got rotten luck stuck in a hotel without internet. We promptly checked out this morning, making sure they knew we left because of the internet. From Istanbul, we said goodbye to warm weather and took a filthy bus to Bucharest, Romania and then an overnight train to Vienna, Austria. We already posted about this segment of our trip because we wanted to share our time in Vienna over Christmas. 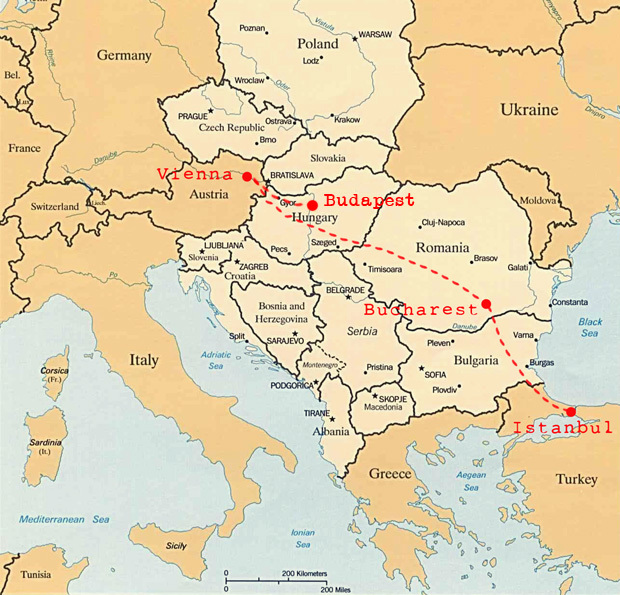 From Vienna, we took a short bus ride over the border to Budapest, Hungary. Budapest is easily one of the most beautiful cities in Europe. The city adorns both banks of the Danube River, and is connected by countless bridges. The most beautiful buildings have been strategically placed along the river for a gorgeous cityscape of steeples, churches, castles, palaces, and the Parliament Building. As long as you reach the river at any point, from any side, you have a breathtaking view before you and you better have a camera in hand. Formerly part of the of Austro-Hungarian Monarchy, Budapest was developed and influenced by the Habsburgs and the fine taste of the Queen (whom we had just learned about while visiting Vienna's Schönbrunn Palace). The temperature outside was bone-chilling cold. The kind of cold that makes you hurt all over. Cold that allows you to take photos for 5 minutes at a time because your fingers turn to numb blocks that no longer can control a camera. However, we all know food tastes 3x better in cold weather, and I will never reject a cafe break to warm up. P.S. We were in Budapest before Christmas, thus you will see touches of holiday decorations here and there. We thought we said goodbye to Christmas Markets in Vienna, but Budapest surprised us [post coming soon]. Budapest Opera House. The king said it could not be bigger than the Vienna Opera House, so instead they built it more beautiful. St. Stephen's Basilica. We were lucky to stumble upon a Sunday morning service with a magical stream of sunlight peaking through the stained glass windows. The church houses an important Catholic relic-- the right hand of St. Stephen, who is highly regarded as Hungary's founding father. More on him later. I wanted these painted wooden eggs for our Christmas tree so very much. Yuriy said they'd have them in Ukraine [our next stop]. They didn't. Still want them [so very much]. This bowl of Hungarian goulash soup was quite possibly the best bowl soup we've ever had in our lives. We still talk about it. The best way to warm up on a freezing day. Budapest does look beautiful! There are always cheap deals for Budapest city breaks, but I've never been able to decide if I should go for it or not. These photographs have proved how amazing the city looks and next time the chance arises, I shall take it for sure! We have some Ukrainian wooden eggs laying around in random parts of our house. I love all the cultural things we own. Especially our Russian style rugs. I am so glad you liked my city! I was waiting for this post for sooo long! :) It is still bone-chilling cold in here, hope you are having sunny, warm weather wherever you are now!! Lovely pictures and new blog-look!! the sunlight in that church is so beautiful - heavenly! Budapest surprisingly reminds me a bit of Prague (which I highly recommend adding to your must-visit list for next time!). A very beautiful city indeed. I love the new redesign of the blog. Mizhenka- You live too close to Budapest not to go! Julie- Yes, every time we think back to our travels through Vienna, Budapest, and Ukraine, I get the shivers. Eva- We really really wanted to go to Prague, especially since its just a short train ride away from Budapest, but it didn't fit into our schedule. We'll definitely check it out next time we're in the area. Thanks! Britums- Funny, we want to go in the summer. Anon- Thanks for all the background info on goulash! Next time we're in Budapest, we will do our best to hunt you down for some real home made soup. Don't be surprised.